Beautiful Aruba offers outdoor enthusiasts plenty of adventure, as I confirmed on a recent trip to the island that lies in the southern Caribbean just 2 1/2 hours from Miami via American Airlines. With less than 24 inches of rain per year, the arid island has surprisingly abundant water sports activities. Aruba is just an area of 70 square miles with 91,500 inhabitants, but tourists "in the know" seem to flock to the island that is now a separate entity within the Kingdom of the Netherlands. No longer is Aruba a part of the Netherlands Antilles, as is nearby Curacao. The official language is Dutch and the everyday language is Papiamento, but most Arubans also speak English. Sportfishermen love the island. Many charter boats are available for deep sea fishing off Aruba, and the variety of fish is vast; sailfish, white and blue marlin, wahoo, dolphin, shark, barracuda, amberjack, kingfish, bonito, and blackfin and yellowfin tuna are abundant. Spearfish are an occasional catch. Giant marlin swim the waters of Aruba. The island record for blue marlin was caught by a local commercial fisherman and weighed in at about 1000 pounds. Sportfishermen with rod and reel have caught blues over 500 pounds and white marlin over 150 pounds. The yellowfin tuna grows to 200 pounds in these waters, and dolphin attain weights of over 80 pounds, according to the local captains. The biggest wahoo caught by sport fishermen reportedly weighed over 100 pounds. The island's charter boats normally fish for blue marlin off the east end between two and 12 miles out. The hot spot there is an area that is about four-and-a-half miles square, according to one captain who has been sportfishing around the island of Aruba for over 30 years. "Waters coming from 7,000 feet up to 250 bring up plankton, baitfish, and everything," he says. "That's where we do very well with blue marlin and other billfish. In one week last year, we released a blue marlin, a white marlin, a spearfish, and a sailfish in that spot. We also caught several 30-pound dolphin and a couple of nice yellowfin tuna!" You can catch bluewater species year round off Aruba. January, February and March are top months for wahoo, yellowfin tuna and blackfin tuna. February is an excellent month for big dolphin, and both blue and white marlin. You never know what you're going to catch in April. The fishing then can be very slow or very good. May catches are mostly dolphin and blackfin tuna with a few wahoo and yellowfin tuna sprinkled in. In the month of June, bonito, yellowfins and wahoo are usually available off Aruba, and in August, you can virtually catch anything. Sailfish start to show up in August or early September with the months of October and November being highlights. 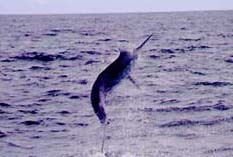 Most sailfish are caught about seven to 15 miles southwest of the island. While a good size sail will run close to 80 pounds, the average is between 50 and 60 pounds. On a good half-day charter today, you could raise 20 and maybe catch five or six. You used to be able to catch 20 a day, but commercial longlining has hurt that a lot, according to locals. October through December are good months to catch kingfish up to 70 pounds. They are generally taken from an area about eight miles south of the island. The top action in November and December is provided by wahoos. December is also the best month to catch amberjack in the 80 to 90 pound range, in addition to good-sized barracuda. The big amberjack are caught about 12 miles offshore from Aruba's capital city and off the north side of the island. The latter area is tops for numbers of amberjack. Tuna are most abundant in the months of February, June, August, and part of September. A super day on tuna would find a boat amassing 30 to 40 that average between 12 and 15 pounds each. The "up to" fish might have a maximum weight of 25 pounds. Most tuna are caught west of the island just two and a half to three miles offshore in depths between 90 and 400 feet. The sharp drop occurs within a distance of just 50 yards, according to island charter captains. The big schools of fish that the charter boats normally locate are tuna, dolphin, wahoo, or bonito. On one four-hour trip, one captain caught 72 fish including 14 wahoo, 11 dolphin, 9 barracuda, a shark and the rest tuna, yellowtail and bonito. While such a trip is usually one of those "once in a lifetime" trips, a good dolphin catch can range from 12 to 15 fish per day. If you catch 30 dolphin, they are usually small fish, but if you catch only six or seven dolphin, they may average 14 or 15 pounds. In the months of September and October, charters normally catch 15 to 20 dolphin each day, and their average weight may be 16 to 18 pounds! The roughest seas, about three to five feet, usually occur between February and August. The maximum seas, however, may approach eight feet. Charter boats can fish year-round, however, because they can fish very close to shore, and still catch fish. The rougher the seas, the closer to shore they fish. The calmer the sea, the farther they wander off. In the months of September, October, and part of November, the seas are mostly like a mirror. When seas are calm in the fall, the charters often fish for sailfish about 25 miles off the east end of Aruba at a location half way to Curacao, or off the north end of the island. When the seas are flat, the charter boats can also run along the Venezuelan coast just 15 miles south of the island. Aruba's charter boats normally fish between seven and 12 miles out. Local fishermen and charter captains normally use natural bait. They catch small tuna and bottom fish with the baits. Those going after marlin will use mostly dead bait, such as ballyhoo or flying fish. The charter captains use ballyhoo about 80 percent of the time, and tuna strips the remainder. They seldom fish with artificial baits around the island. There are around 15 sport fishing charter boats on Aruba, and eight or nine run constantly. The typical charter rate is around $300 for half a day, and double that price for a full day. Those visitors who book full day charters are usually avid anglers who fish a lot in their own countries. The beautiful blue-clear water is the basic ingredient in Aruba's sporting life. Sail, water-ski or windsurf over it, scuba and snorkel beneath it, float atop its gentle waves or fish for the giants. Scuba is always on my itinerary when on the island and one of Aruba's most unusual sights is the wreck of the German freighter, "Antilla". It was scuttled just off the beach of Malmok north of the island's hotels during World War II. That area and the waters just east of Spanish Lagoon where visibilities can be up to 90 feet, are among the best for scuba divers. Lessons, reef excursions and other organized tours are available. Divers that are looking for new areas to explore can obtain a guide to dive sites in Aruba. A dive map which highlights each site and includes some of the Caribbean's most interesting wrecks and pristine reefs can be explored through many of the island's dive operators. Many of the dive sites are located in shallow waters which range in depth from 30 to 60 feet, making the island a perfect location also for novice divers. An underwater bounty of plant and animal life, the waters offers an opportunity to see starfish, parrotfish and stingray, as well as tub sponges, seafans and a wide range of corals. Red Sail Sports offers both morning and afternoon dives aboard their 40-foot dive boat, the "Vista Mar." It easily accommodates 24 divers and offers fresh water showers, fresh water rinse buckets, restroom facilities and a spacious dive platform. Cold beverages, fresh fruit, tanks, weights and belts are provided on all dives. Red Sail Sports has several locations on the island, including the most developed one on Sonesta Island just offshore of the capital Oranjestad. Perhaps the very best accommodations on the island are at the Aruba Sonesta Resort located at Seaport Village Complex in Oranjestad. The area, just 4 miles from the international airport, includes two Sonesta hotel/resort facilities, Sonesta Island, over 120 boutiques and shops, two casinos, several great restaurants, a marina, three cinemas and a conference center. The Aruba Sonesta Resort offers 300 guest rooms, including 15 suites and the adjacent Aruba Sonesta Suites offers 250 one-bedroom suites, each with kitchenette. Guests at both properties have exclusive access to Sonesta Island, a short, 8-minute boat ride from Seaport Village. 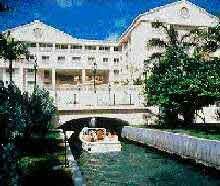 Guests board a private water taxi in the lobby of the Sonesta Resort and are quickly delivered to the water sports island. The water shuttle goes back and forth every 20 minutes between 8 a.m. and 6 p.m. daily. Sonesta Island is a 40-acre paradise that offers private beaches adjacent to tropical foliage. Swimming, wave runner jet skiing, catamaran sailing, ocean kayaking, tube rides, snorkeling, scuba diving and other activities are part of the extensive Red Sail water sports program there. Natural coves with mangrove trees and wildlife are located in several areas, and guests can enjoy walks through the island's Nature Trail. Deep sea fishing, sailing cruises, parasailing and water skiing can be arranged. There is also tennis, a fitness room, and a restaurant and bar to enjoy. The resort offers a wide selection of restaurants and bars with a variety of cuisines and ambiance: L'Escale is known of its fine ding and popular Sunday brunch; the Brasserie offers casual fare, the Seabreeze Restaurant and Bar features light lunch and snacks on Sonesta Island, and the Captain's Corner offers all 3 meals in a casual atmosphere, poolside at the Sonesta Suites. Nightly theme dinners allow guests to savor specialties from around the world at festive buffets in a variety of settings. For a little more land-side activity, hotel guest can book tee times at the Sonesta. Located in the northwest tip of Aruba, a ten-minute drive from the resort, is the Tierra del Sol Golf Course, a magnificent desert-links golf course designed by Robert Trent Jones II. The par-71 course offers 18 holes with dramatic oceanfront vistas. For information and reservations at the islands best accommodations, contact the Aruba Sonesta Resorts at 1-800-SONESTA. For info on water sports activities, contact Red Sail Sports at 1-800-255-6425. Visitors to Aruba need a valid passport or proof of citizenship such as a birth certificate. All visitors must have a return or ongoing ticket, and the airport departure tax is currently $20. Click if you want help with flights to Aruba. Aruba is an interesting island to explore. You can experience Aruba's past by visiting the caves at Fontein and Quadirikiri with their ancient Indian markings or the Frenchman's Pass where Arawak Indians defended Aruba against the French in 1700. You can see Aruba's natural wonders at the rock formations of Casibari and Ayo with their panoramic views or at the natural bridge, carved by the surf on the north coast. Traveling through the countryside you'll notice wind-shaped Divi Divi (Watapana) trees, colorful flora, cacti, and many Aruban houses with Indian designs on their walls. You may want to climb the Hooiberg (or Haystack), drive up the Jamanota for a panoramic view of the island, or hike through the Natural Preservation Park. Expedia.com - Compare Air Fares!